We arrived at our hotel in Stavanger on Friday. With its 21 floors, it is the second highest building of Norway. Elfe and I ran immediately up to the top. Later we learned that the hotel presented a diploma for its guests who took the stairs all the way up to the top, so we had to do it again. On the top floor was a restaurant where we ate breakfast twice. Breakfast was amazing. Every morning we had donuts and cakes. There were also a lot of different kinds of fruit. We also went to an Italian restaurant. The waiter spoke French, English, some Dutch, probably Italian and for sure Norwegian. It was amazing how many languages he could speak. I woke up too early, but the positive news is that I was awake. Our restaurant on the 21th floor wasn’t open yet, so we had a lunch bag. It was disgusting. We had a slice of bread with salad, ham, cheese, cucumber and mayonnaise. For desert an apple, which I couldn’t eat after having finished the bread which was too thick. Olivier went to the supermarket and bought us something else to eat. 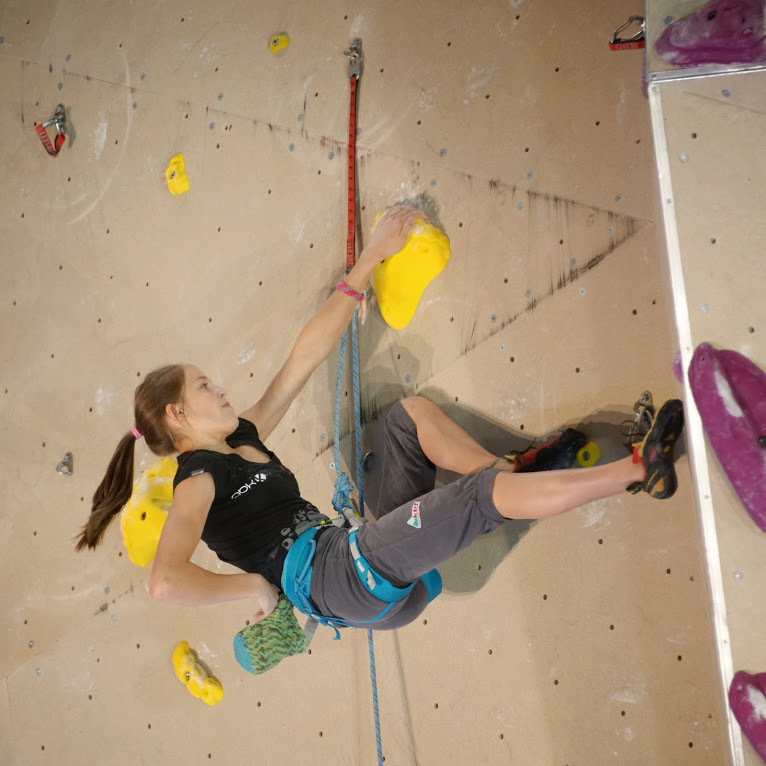 Liselotte said that it would be very cold in the climbing hall because it was in an ice rink. Therefore, I put on as much as possible. I wore 4 jackets and a t-shirt. When we arrived, I was dressed too warm, even though it was colder inside then outside. I took off one jacket. That means I was still wearing 3 jackets and a t-shirt. I didn’t have much time to enjoy myself. I had to warm up already. When I started warming up, I took off everything, except 1 sleeveless jacket. There were 2 walls for warming up, both walls were overhanging. When completely ready, I went to the hall to watch Elfe who almost gave me a perfect demo. Then I saw Héllo touching the top. Maëlys was really good in it and was also touching the top. I put on my shoes, next up was me. At the big undercling, Maëlys was able to rest easily, but I was a bit too tall for it, so I continued and reached the last move. I knew this was tricky, so I rested a bit. Then I said to myself: Go! I held tight to the last hold, clipping in the last quick-draw. After the first selection, we went back to the hotel to rest and sleep. I slept for half an hour. When we returned to the gym, I immediately had to start warming up. I saw Elfe, who fell two moves from the top. Maëlys fell one move from the top. Héllo topped. I did what Héllo did, I topped, but it was a stressful route on the vertical wall. This isn’t my type of wall. I love the overhang. I had to climb relaxed and go to the top. Every hold higher, I thought that I was almost there. We left the gym early to be on time for our diner. We took a shower and prepared for diner. The next morning, we didn’t have to rise early, which meant we had breakfast on the 21st floor. I was trying to eat everything. We went to the climbing area. I had to climb last and still had to warm up early. It went quicker then I thought. I had to climb already. My group had the purple route on the right side of the wall. The first part was okay. When I reached the undercling, I saw that I had found a kneebar with a hands free rest. I rested a little, but two holds farther I fell because my foot slipped. 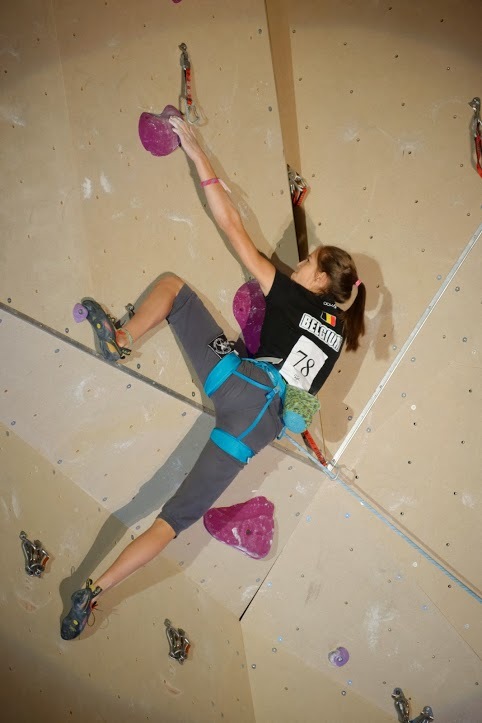 Alina Ring from Switserland had almost climbed to the top and won the gold medal. Eva Scrocarro got silver. I was third. 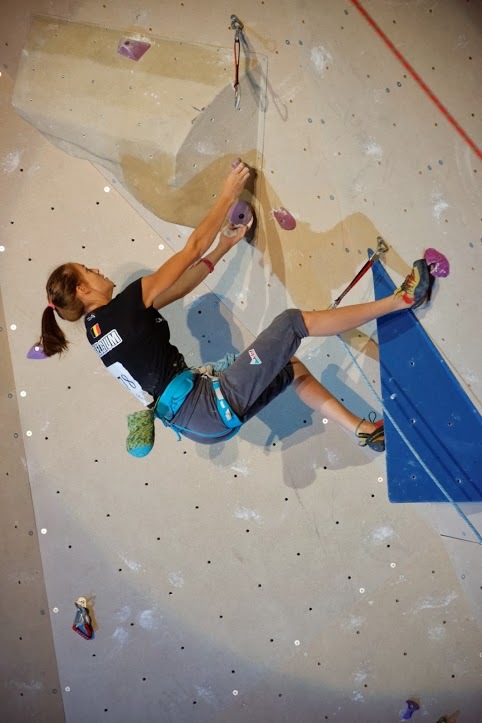 Héllo did a very good job climbing to the fourth place. Maëlys became 10th and Elfe 12th. 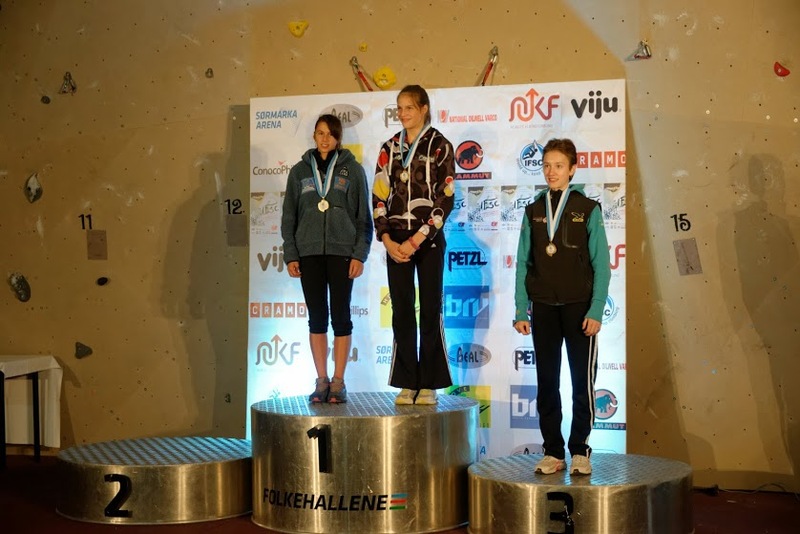 Anak won gold in the A-group, Chloé became 7th, Margot just missed the finals with an 11th place and Julie became 13th. We didn’t have boys competing in the A group, but in the B group Nicolas Collin became 6th, Nils Lemière 18th and Arnaud Ansion 19th. Our juniors Lukas Geukens and Émilie Guérit became 9th and 10th. Although the first three of the competition received a bag filled with beautiful presents, there was no medal. 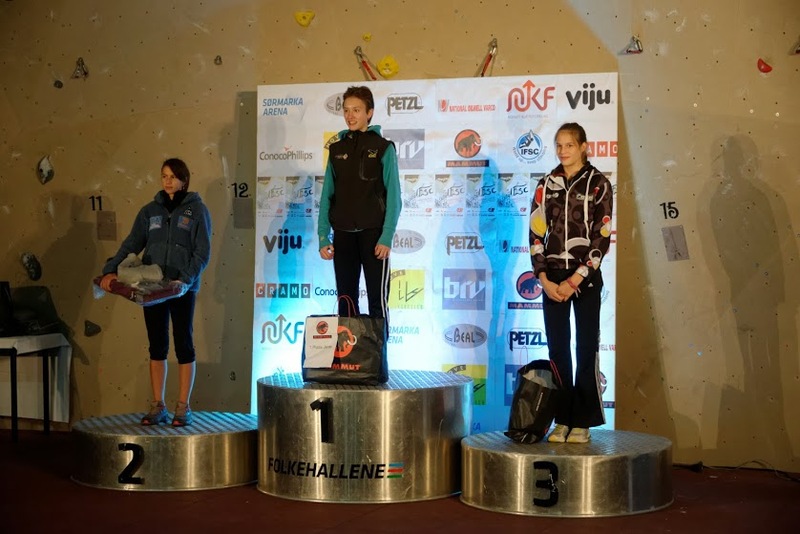 It is always sad not to receive a medal, as for us climbers, this is the most important keepsake we are really proud of. Both first in the end ranking, Anak and I had to climb the podium twice. The second time to be awarded with the cup, which was actually a medal. All in all it was really amazing that I won the cup, albeit together with Eva Scroccaro from Italy. And it was rather funny to have 2 national anthems played. Anak had to share the cup too with Julia Chanourdie from France, so again two anthems were played. Back home, my dad was very happy. He had promised me a camping trip if I brought home the cup, but now there is a lot of discussion in the family whether this is considered a “cup” or not.